Interesting Divergence behavior in USDINR Daily charts while trying to use Fisher Transform indicator by Ehlers. Almost every divergence as shown in the above charts extended any where between 28-34 days. Divergence generally occurs when an indicator and the price of an asset are heading in opposite directions. Current positive divergence is running on for last 32 days i.e USDINR rate is slowing and moving down however fisher indicator is turning upwards. Is this cycle behavior likely to continue in the near trend? 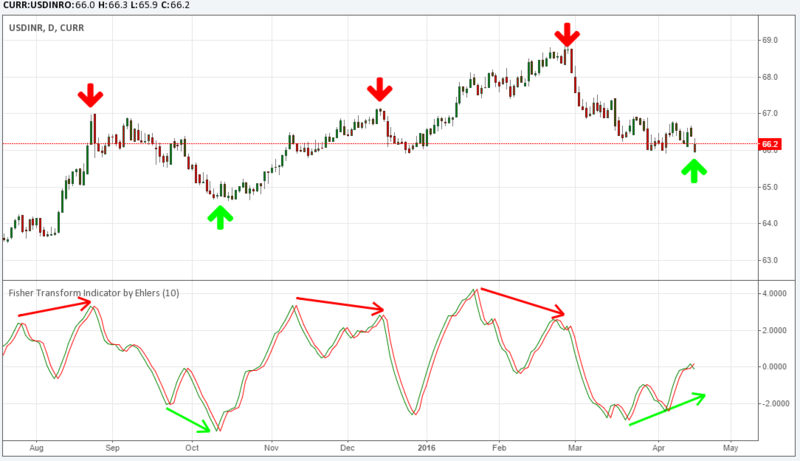 Does this indicator forecasting a near medium uptrend in USDINR? What is your take?